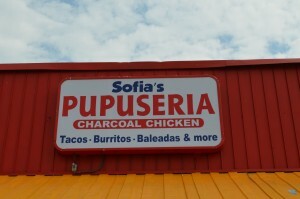 The brand new restaurant on the Pike, Sofia’s Pupuseria, where I had my first baleada. Two weeks later, a participant at my story-sharing and art-making workshop drew a picture of her hometown with a Baleada shop and Arlington with a McDonald’s. Did you know that restaurant owners are very busy people? Over our wettest May ever and the perpetual construction on good ol’ Columbia Pike I am thrilled to report that despite their businesses being hectic I have collected 12 interviews and recipes for my Columbia Pike Recipe Book for You 2016 project. This Arlington Arts project is about celebrating the food diversity of Columbia Pike and getting to know the stories of the hardworking, creative, and courageous restaurant owners and chefs that make up that vibrant community. I interviewed independently-owned restaurants on the Pike, and designed their stories and recipes into individual pages of a book. These will be displayed on a custom-designed “menu board” where you will be able to see the diversity, pick the recipes you like, and assemble them into your very own book, binding them with a cinnamon stick, birchwood spoon, or bamboo chopsticks—whatever catches your fancy! Stop by my art tent at the Columbia Pike Blues Fest 2016 on Sat. June 18th, 1-8 pm, to make your own Columbia Pike Recipes for You book and find out more. One restaurant owner shared many little details of her life story with me—some very personal to share with a stranger you might think. But then again, sharing with a stranger is often easier. She told me of the time she had decided to open a restaurant. When her husband said he’d lend her the money she told him she didn’t need it as she had her own money saved up. So right there in her restaurant I gave her a high five and told her she was awesome. She giggled like a little girl. I felt great too, knowing there were strong women all around me, whether I knew their story or didn’t. Then there was the chef who wouldn’t let me take his photo. He needed a shave he said, and no matter how many times I told him the stubble was in, he didn’t oblige. After he went into the kitchen I asked the bartender if he was a shy person. Before he could answer the chef came bursting out of the kitchen saying, “Shy? I’m the opposite of shy! I talk to everyone. Today, I’m just busy.” We all laughed. Then his bartender asked me where he could buy art supplies. He was an artist and had moved here three weeks ago. So I invited him to come to the Studio and paint. A woman chef on the other hand, proudly posed for the photo in her flour-dusted apron. That was her make-up, we joked—the flour—and the restaurants she had created thanks to it. She offered to share more of her story, especially with young women, to help them on the journey of life. To learn from others’ mistakes is much better than making all of them yourself, she said. Another restaurant owner thanked me for taking the time to do this project. At first I was surprised but then I got goosebumps as I explained to her the name of my Studio and pointed to my business card by her elbow. She put a hand on her heart as she looked at my card, and said that this work was very important. Learning about each other through our individual stories was a great way to learn about our community as a whole. 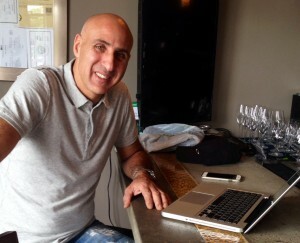 One of the chefs has a degree in computer science from George Mason University. But he has been cooking with his mom since he was 10 years old. It was in his fourth restaurant that he finally served food from his culture. He did it well, he said, and felt it was time. Somebody told me to get the story of the restaurant that has a certain popular American food in its name but doesn’t even serve it anymore. How can that be? So I got the story and its an incredible one. Yet they kept the name, the owner told me, because everybody knows them by that name—here and abroad! One owner told me how he didn’t change the cuisine of the restaurant he bought to serve food from his country. It was because he didn’t want to compete with the restaurant next door which did serve food from his country. 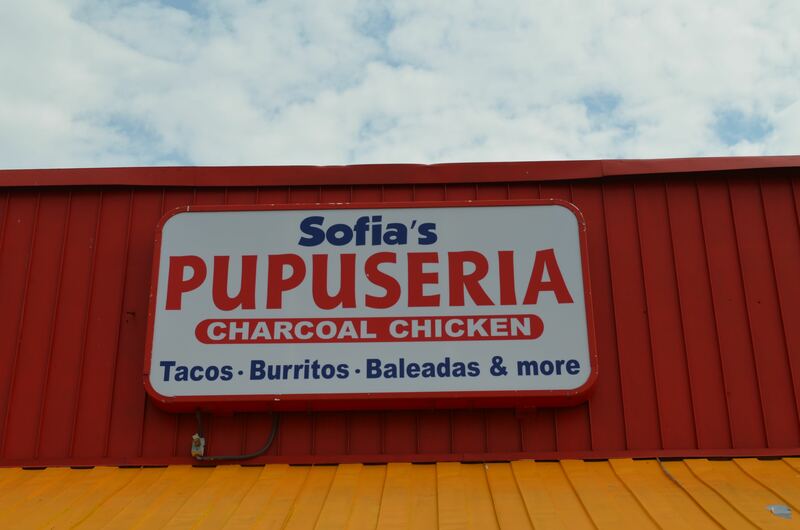 “My brother wanted to have his own restaurant and we were happy to return to Arlington from Maryland,” he said, so they stayed with serving Peruvian and Bolivian food. And I met the best bartenders on Columbia Pike. They told me their restaurant was the “Cheers” bar of the neighborhood. Everybody knew each other there! I went home and asked my husband what the Cheers Bar was. I have only been here 17 years after all. She has been here much longer. When I asked one restaurant owner when I could interview and photograph her she gave me a date and said she would get her hair done. Her mom owns the hairdressers next door to the restaurant. Remembering the story of her mom’s “We Can Do It” attitude kept me going when things got tough on this project. One restaurant owner had decorated his restaurant with 30-40 year old photographs from his childhood hometown and country, taken by a photographer friend there. It helps him create the right atmosphere even as current sports play on the TVs on the walls. Running a restaurant was in his family, a partner at another restaurant said. His dad and uncle have been doing it for decades. He went to high school in Washington-Lee but decided to join his dad and uncle because he wanted to give back to the community and the community seemed to love food from his country. Riyad Bouizar, owner and chef of Mazagan on Columbia Pike. Some stats that jumped out at me when I finished the designs are listed below. Remember, I just let the restaurant owners and chefs tell me what they wanted to share. I did not have a set of questions for them. All 12 partners I spoke to (or their parents who started the restaurants) are foreign-born. 8 of 12 told me they had worked in restaurants before opening their own. The dates of when people told me they came here from Bolivia or El Salvador relate to the dates of the economic crisis in Bolivia and civil war in El Salvador. 2 mentioned going to culinary school and 9 told me they finished high school in Arlington. 9 serve food from their native countries. So I kept visiting the various restaurants—at 9 am and even at 9:45 pm— chatting with staff, managers, and owner’s spouses or siblings, just trying to get an interview and a recipe, or trying to convince an owner or chef that this was a good idea to participate in this project. Along the way I listened to babies crying when I was on the phone with an owner, and stumbled across language barriers as well. I got a free baleada, mango lassi, 2 lunches, and 2 coffees thanks to the owners’ generosity and hospitality. After all, it’s about making the time to build community and share our stories. And it seems to happen best around food!